The Giant bicycle company has announced a recall of bicycle forks from its 2009 line that it manufactures because one of the forks broke unexpectedly. 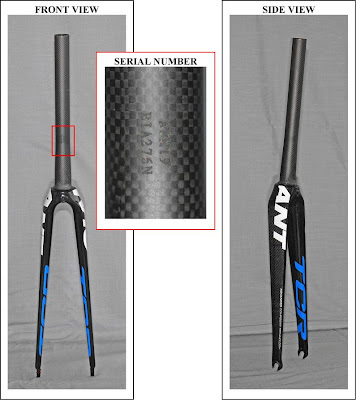 This is a voluntary recall that involves 2009 TCR Advanced SL Team, SL 0, SL 1, SL 2, and SL (ISP) model bicycles and frames in silver, charcoal, blue and red. The words Giant and TCR Advanced SL are printed on the frame. These high-end bikes were sold by authorized Giant Bicycle dealers nationwide from August 2008 through December 2008 for between $3,300 and $7,500. Giant requests that riders stop riding the bikes right away and contact a dealer for a free inspection and replacement fork.